Braces are prescribed and designed by orthodontists and they work by applying steady gentle pressure to the teeth, moving them to the desired position and improving the way they meet. There are different types of braces and your orthodontist will be able to recommend the one which is most suitable for you. Removable braces are made of plastic and usually have a small number of thin wire components which are designed to move teeth. Recent innovative development means that a “wire free” design is now possible and will become more popular. These braces are worn full time by the patient but can be removed for regular cleaning and, very occasionally, eating. They are mainly used for the correction of relatively minor orthodontic problems. However, in suitable cases, they can produce a good result in a relatively short time and at a low cost. Functional brace is a type of removable appliance that works on the upper and lower teeth at the same time. It is designed to change the functional position of the lower jaw to correct the “bite” of the teeth. With good patient’s cooperation, functional braces can correct a difficult “bite” problem in a relatively short time. A fixed functional appliance design is also available and is great for non-compliant patients. Fixed braces consist of small individual tooth brackets which are tied to a thin piece of arch wire. The brackets are attached, with special dental adhesives, to the upper and lower teeth and they stay for the whole duration of the treatment. The arch wire can be removed and replaced by the orthodontist in each treatment visit. 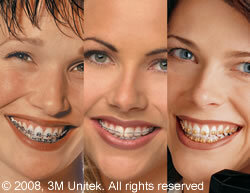 these are metal braces most commonly used in orthodontic treatment and can offer a choice of different lively colours. these are low-force, low-friction braces which offer greater comfort and faster treatment. Examples include the Damon, In-Ovaltion and Smartclip systems. these are special metal braces fitted behind the teeth and are therefore not visible in the face. No one will know that you are wearing braces. However, lingual braces are more difficult to fit and the treatment will generally be more expensive. The Invisalign system uses a series of thin clear plastic trays (ie aligners) instead of brackets and wires on the teeth. These plastic aligners are made using patented 3-D computer technology. They are worn by the patient full time and changed once every 2-3 weeks to gradually move the teeth to their correct position. The aligners are almost invisible and are taken out only for eating and teeth cleaning. © 2008, Invisalign is a registered trade mark of Align Technolgy Inc.